The wicked do not have a fear of God and therefore their days are shortened, and things do not work out well for them. (Ecclesiastes 8:8-13) There is no man that hath power over the spirit to retain the spirit; neither hath he power in the day of death: and there is no discharge in that war; neither shall wickedness deliver those that are given to it. All this have I seen, and applied my heart unto every work that is done under the sun: there is a time wherein one man ruleth over another to his own hurt. And so I saw the wicked buried, who had come and gone from the place of the holy, and they were forgotten in the city where they had so done: this is also vanity. Because sentence against an evil work is not executed speedily, therefore the heart of the sons of men is fully set in them to do evil. Though a sinner do evil an hundred times, and his days be prolonged, yet surely I know that it shall be well with them that fear God, which fear before him: But it shall not be well with the wicked, neither shall he prolong his days, which are as a shadow; because he feareth not before God…… (Psalm 37:12-22). It may seem harsh to think God would laugh at the calamity of anyone, but He is a teacher of tough love which in righteousness teaches through great council for wisdom saves from evil. (Proverbs 2:24-29) ……. (Proverbs 12:15). Wickedness will not stand as God will cut them off from the earth, and though many feel they can live as they want without God observing………. little do they know transgressors will be rooted out! (Proverbs 2:21-22). 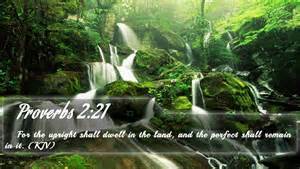 For the upright shall dwell in the land, and the perfect shall remain in it. But the wicked shall be cut off from the earth, and the transgressors shall be rooted out of it. Those who follow what is right know what is acceptable to the Lord, while the wicked speak uncontrolled in words that are away from God. (Proverbs 10:27-32). The fear of the Lord prolongeth days: but the years of the wicked shall be shortened. The hope of the righteous shall be gladness: but the expectation of the wicked shall perish. The way of the Lord is strength to the upright: but destruction shall be to the workers of iniquity. The righteous shall never be removed: but the wicked shall not inhabit the earth. The mouth of the just bringeth forth wisdom: but the froward tongue shall be cut out. The lips of the righteous know what is acceptable: but the mouth of the wicked speaketh frowardness.